This self portrait was inspired by costume elements I had bought during the years I lived in Berlin. I had just quit smoking, which may help explain my expression of pure, spluttering, helpless rage. But then, maybe I'm just a psychopath at heart. 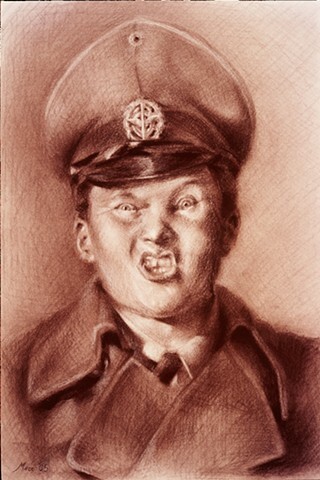 "Self Portrait as Fascist" was later exhibited at Frolick Gallery in Portland, Oregon, as a part of a special group exhibit entitled "First Person." No one bought the drawing and I don't blame them.